Obituary – Krisher, Mable Lena (Ringler) « Perry High School Alumni Association, Inc.
Ishkadah ’20, Club Espanol, Glad Club. ﻿Mable Lena (Ringler) Krisher, age 97, of Midwest City, passed away October 17, 1996 after a long illness. She was born in Perry, OK August 20, 1899 to William B. and Mary M. (Fest) Ringler. She was married to Irwin Krisher on June 10, 1927. He preceded her in death in 1979. Mrs. Krisher taught school in Perry, and was a longtime nursery school teacher in Midwest City. 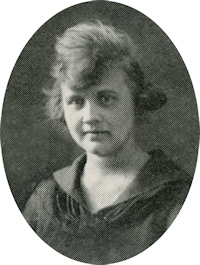 She was a member of the First Baptist Church of Midwest City, where she worked with primary school children, and was also a member of Eastern Star, the American Legion Post 170 Auxiliary, and the Veteran’s of WW I Auxiliary. She was always positive, cheerful, and full of love. She enjoyed many things, such as music, playing piano, flowers, animals and entertaining others. She even won the “Miss Congeniality Award” at her nursing home. She was an excellent homemaker and mother, and dearly loved her friends and family. Mrs. Krisher is survived by her daughter, Doris Pope; a son, William I. Krisher; 4 grandchildren: Charles Pope, Larry Pope, Eric Krisher, and Chad Krisher; 4 great-grandchildren: Shelly Pope, Cameron Pope, Brian Pope, and Melissa Pope; and 2 great-great-grandchildren: Tony L. Pope and Taylor Martin. Besides her husband, Mrs. Krisher is preceded in death by a daughter, Ruth Yvonne Krisher. Funeral services will begin at 2:00 p.m. Monday, October 21, 1996 at the First Baptist Church of Midwest City, with burial following in Arlington Memory Gardens.